Minming is confident it can. As co-founder of the company responsible for the Mu6 wireless headphones, she showed me some unique functions in addition to ANC (Active Noise Cancellation) that competes with -and possibly surpasses- the best in the market. To do this, they put a nice, big target on the market leading Bose QC35 as a performance benchmark and added innovation and affordability to top it off. The Mu6 headphones are fairly light, and the fit around the earcups make for very good passive noise cancellation and comfort. The use of high density memory foam comes at a higher cost, but according to the Mu6 team, you get much better Active Noise Cancellation when you first get the passive noise cancelling design right. Its magnetic charge stand is quite pretty to look at too, reminding me of a treble clef when you look at it from an angle. Minming had it charging from a powerbank (!) via USB which took me by surprise, but it was even more interesting to see the headphones hanging UNDER the chargeport magnetically, not hanging on top of it. There's also a transparency mode in addition to ANC, which lets in the sound of the immediate environment. So not only can you block outside noise, but you can let it in when you need to. I've only seen this function in one or two other headphones, but it's a really useful option to have - especially in big cities where you need to keep an ear out for honking cars, traffic cops, and the occassional homeless guy shouting weird things at random people. On AUDIO QUALITY, they've done an amazing job on their approach to what good sound is. Most reference headphones are rated (or "prized") for their flat frequency range. But this doesn't take into account an individual's ability (or inability) to hear certain sounds. To that end, the Mu6 team has fine-tuned and developed a hearing sensitivity app that measures your personal hearing and compensates for frequencies that are lacking or overly sensitive for your ears. On USER EXPERIENCE, the most memorable and practical function is the Smart Touch and Talk. Placing your hand over the left earcup immediately enables a kind of transparency mode, which simultaneously lowers the music volume while letting in sound attenuated to human voices. It's extremely useful when you need to hear a subway announcement or chat with your barista for a coffee order. When you're done, you simply remove your hand to return to your regularly scheduled setting. Another great feature is Auto Pause and Play. Using an IR sensor, the Mu6 detects when the headphones are removed from your head and pauses the music to save power - on both the headphones and your music player/phone. While some competitors may also have this function, the pressure switch built into the earcups aren't as sensitive, and may need to be replaced over time. Question is, how much will it cost you for a replacement? There's no such question with the Mu6. Anything else you should know about? Well, you're endowed with 24 hours of battery life (with ANC and music playback on), and the connection protocol is Bluetooth 5.0. Drivers are 40mm. So on and so forth... but at this point, you know most of the important bits. Based on my meeting with the company, it's clear that the team behind Mu6 haven't just slapped something together with randomly available parts using some contract manufacturer’s OEM design. In fact, this product has been in development for over 2 years with a team in Shenzhen to keep an eye on the supply chain and manufacturing. Great quality ANC headphones are just too expensive for most consumers with a cost hovering at $349. 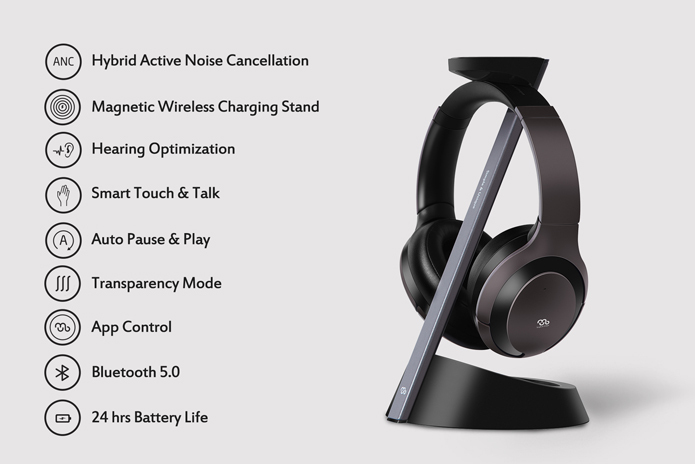 But Mu6 is a product offering high performance ANC comparable to the best in the business, plus charging stand and everything for $249 - which is a $100 less.